Join Energy One America at the ABAA Air Barrier Conference this week in Baltimore to find out. 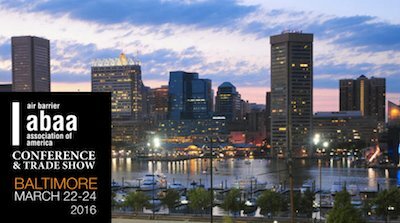 The Baltimore Inner Harbor to Host the 2016 ABAA Conference. The adoption of more stringent State Energy Codes will have significant impact on the building industry in the next several months and years to come. Energy One America is committed to understanding the total wall assembly approach to building envelope and the integration of Air Barriers, Vapor Barriers, Water Resistive Barriers and Insulation and their impact on future construction. “Building professionals will be required to embrace new technologies and approaches to remain effective and competitive in the future. Attending conferences and continuing education are required to stay apprised of these changes”, stated John Kish, VP of Commercial Sales at Energy One America. For information about value engineering you building envelope please do not hesitate to call Energy One America at 843-388-6260 or visit our website at www.eneergyoneamerica.com.